Swing Clear Door Hinges add clearance for wheelchairs in existing doorways. Add wheelchair or walker clearance to an existing doorway or new construction with 5 Knuckle Swing Clear Hinges. Designed to swing a door completely clear of it's opening when it's opened 95°, swing clear hinges increase accessibility throughout the home. Reversible for left or right applications. 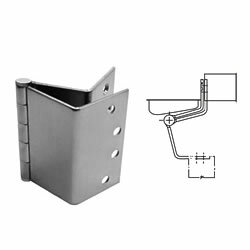 Designed to replace existing 3-1/2" or 4" hinges, (3-1/2" hinges are usually used in interior applications and 4" are used on exterior doors). Please measure your existing hinges to ensure your size requirements. Available in satin brass and satin chrome . 3-1/2" Hinge: uses six screws; 4" Hinge: uses eight screws.